Second Valley is known to ‘the locals’ as ‘Secret Valley’. Here you will find a hidden secret valley that hasn’t been overrun by masses of tourists. 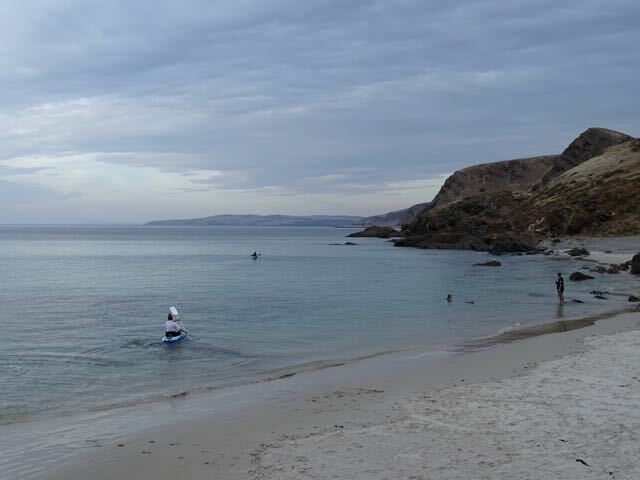 Second Valley is a great place for a few days vacation or an overnight stop to or from Kangaroo Island. 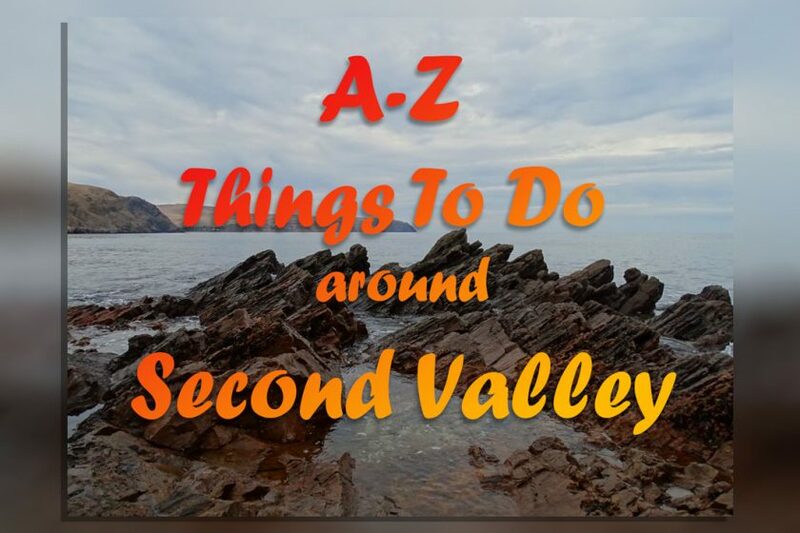 There are so many things to do around Second Valley that we thought we’d share them with you. This piece of paradise is a protected cove-like beach that makes it ideal for families with small children. It is rated as one of the Top Ten best beaches in Australia! 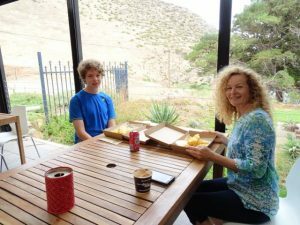 We’ve just enjoyed several days at Second Valley Caravan Park and thought we’d let you in on some of the secrets and better-known great places and events we enjoyed as a family. So, don’t get stuck in a ditch heading to your next vacation, use our guide to give you some great tips for fun times with the kids. Things To Do around Second Valley. Make sure you go for a drive and see what animals you can find. 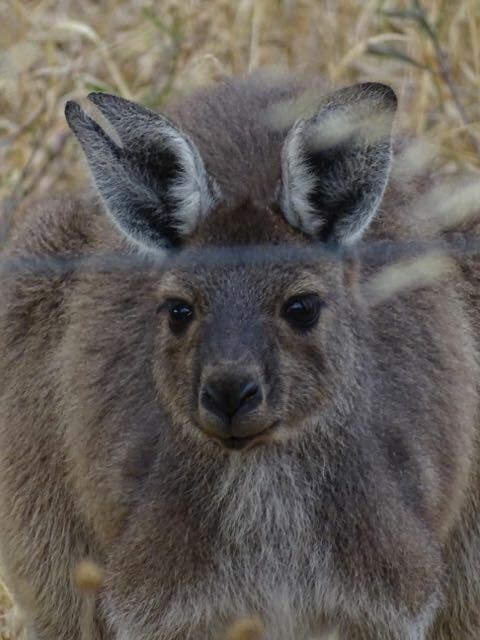 There are a number of kangaroos and wallabies around. 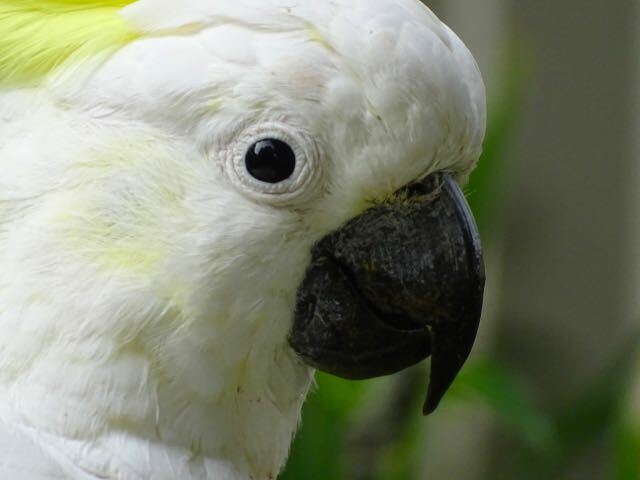 These are not friendly and should not be approached or given any human food too. Apparently, kangaroos go a little crazy after they eat carrots and can attack people. Please enjoy our Aussie wildlife from a distance. Don’t forget to look up! There are plenty of Eucalyptus trees that are home to our furry koala friends. Please don’t try to cuddle them – they have extremely sharp claws. However, should you see an injured koala or other wildlife, please do report it to Fauna Rescue. 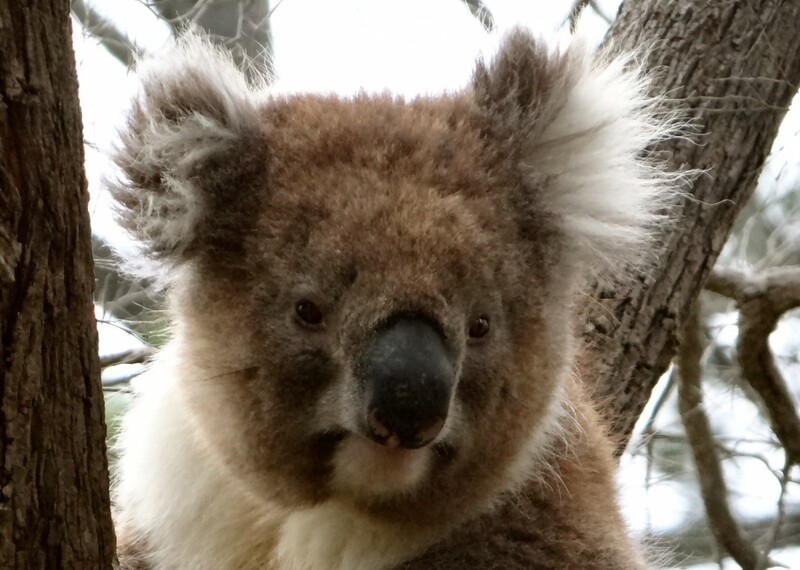 In extreme heat, koalas will drink from a water bottle or bowl, especially if rescued from bushfire zones. Not a favourite, but still awesome if you spy one. 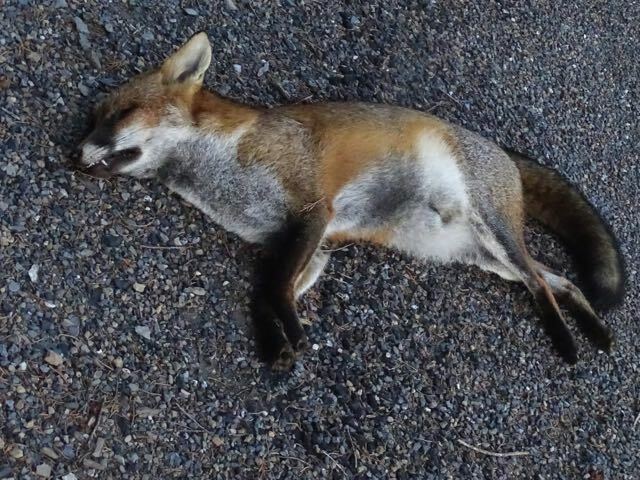 We found the sly fox, but he’d just been hit by a car! Fortunately, we think this save the hens he was heading straight for. Shetland Ponies, Standard Ponies, Horses and Donkeys are all bred in this area. 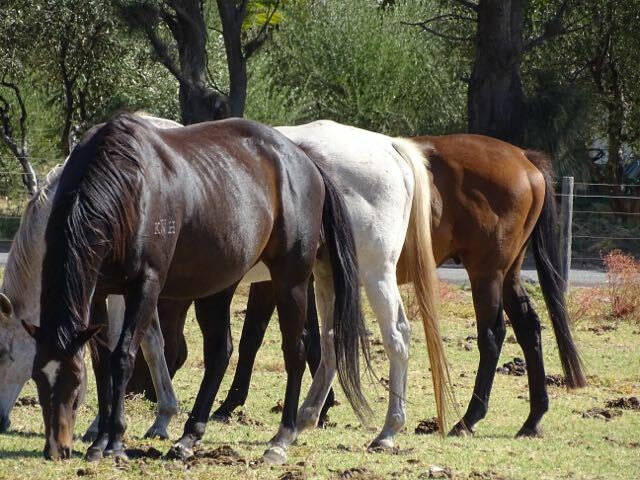 Enquire about horse-riding at some of the public farms and near Wirrina Cove there is also horseriding available. 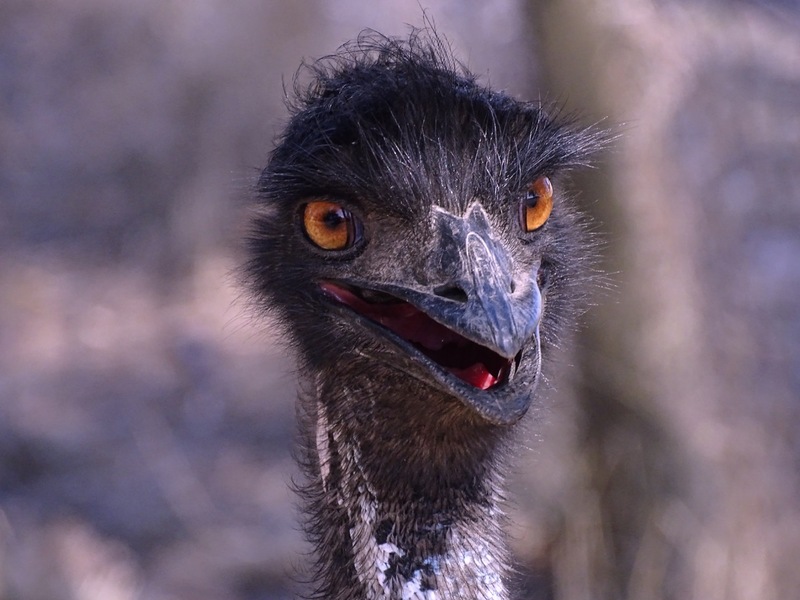 Emu’s are fascinating birds and they can outrun a car! We managed to find two emu’s and had a great time with them safely on the other side of the fence. You can also find a couple of emus at the Fork ‘N’ Beer Farm on the way to Rapid Bay. Quite noisy bird, this pink-chested bird is often seen at sunrise and sunset. 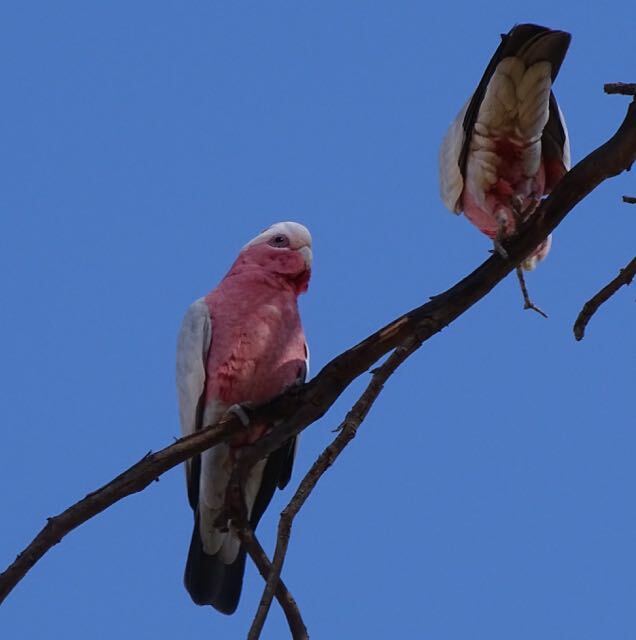 Not known for their intelligence, you will here a true-blue Aussie exclaim you “flamin’ galah” or you “stupid galah”. 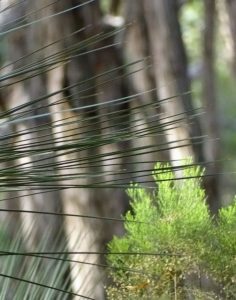 Second Valley is known for the beautiful flocks of white cockatoos that grace the gum and pine trees. Often can be seen in the hundreds in the trees that are on the road down towards the Second Valley Jetty Store. Young and old will love bringing their boogie boards down to the low waters of the Second Valley cove. It’s a great and safe area to have some fun if you aren’t so keen to head out into the ocean. 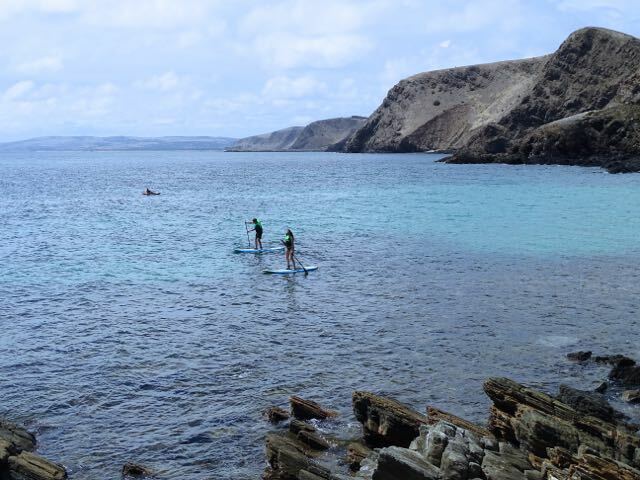 For something different, try renting a paddleboard from the Jetty Store at Second Valley. 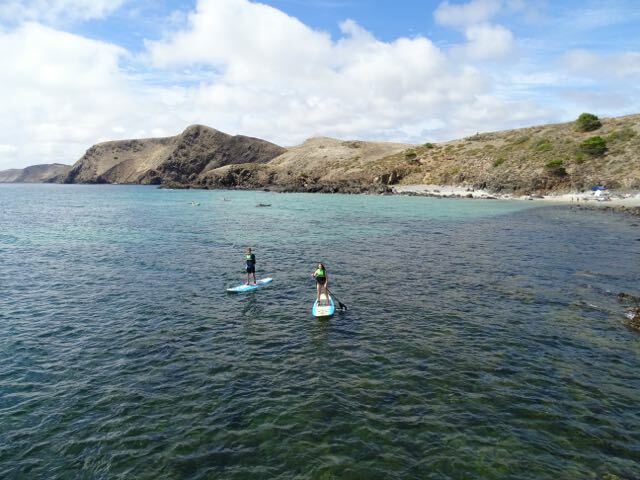 They are great for balance and the protected cove is a top place to learn this sport. We were joined by my sister and my niece for a un afternoon out on the water. 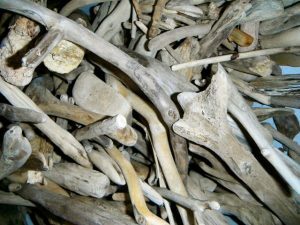 Whilst shells and sea glass might not be plentiful, there is an area to the left of the jetty once you walk past the Cliffside that is a great area to hunt for shells and sea glass. 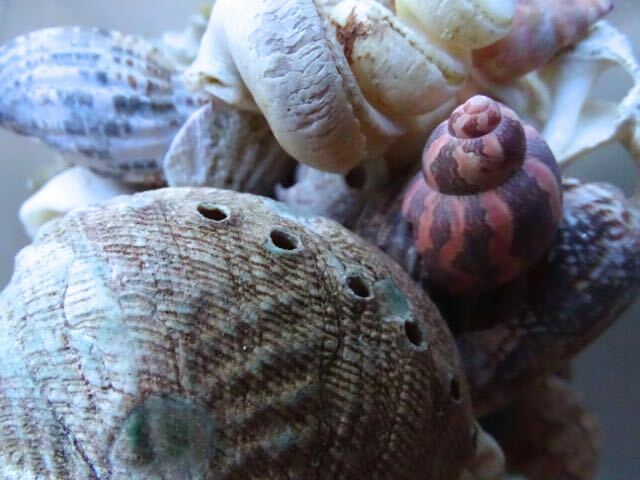 Even on a day too cold to enter the water, a walk on the beach is still fun to hunt for shells. If you do bring down your paints, why not go pine cone collecting and paint some or make sheep with them as a craft activity. 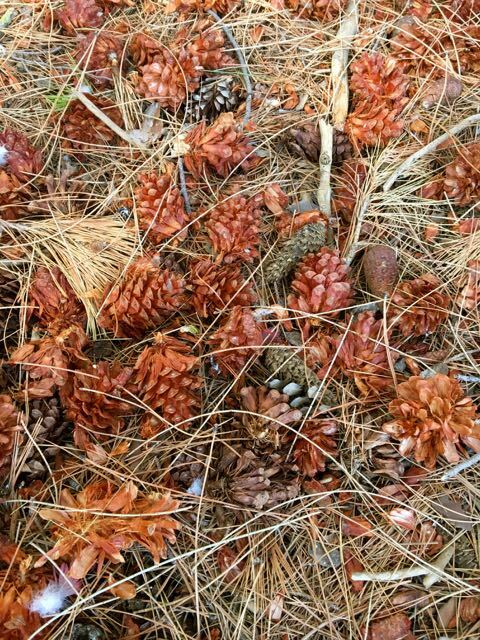 Pine cones are great for Christmas displays. 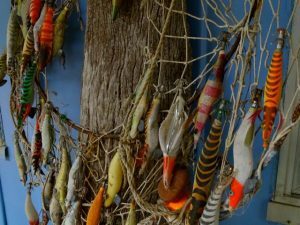 Nothing is quite as much fun as finding a basketful of beautifully coloured feathers! 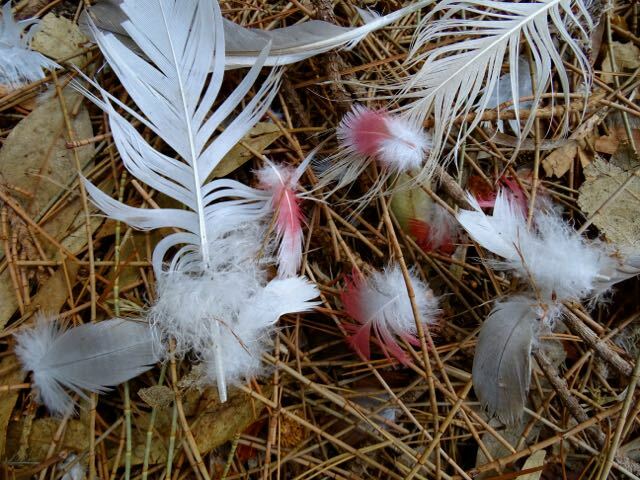 Kids love scouring the pine needles with white, black, grey, pink and yellow feathers all easily found in the Second Valley Caravan Park area. 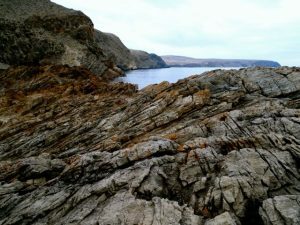 A great place to world-school and learn about geology is right on the beach at Second Valley. A plethora or rocks awaits the avid collector. You can find pink rocks, striped rocks that look like liquorice allsorts and even pure white rocks too. 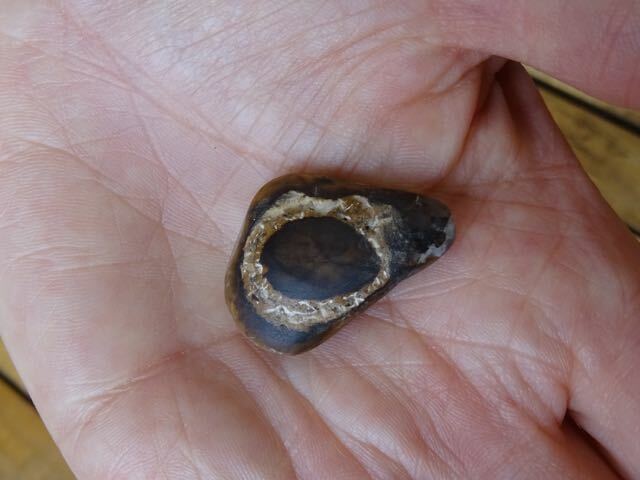 ‘Catseyes’ are often found on the beach and are great to hunt for also. Not far away is the ‘Deep Creek Conservation Park’. Go for a drive and stop the car in the middle of the forest, The silence as you step out of your vehicle is golden. 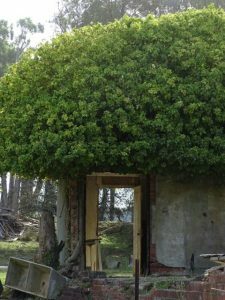 Enjoy the vast variety you will find from areas that have endured the scorch of a fire, to the beautiful plant nursery. Do you feel like letting out your aggression? The paintball might just be the game for you. Protective clothing is provided too. ‘Last man standing’ wins! One of my favourite places to visit has always been the old Delamere Uniting Church. 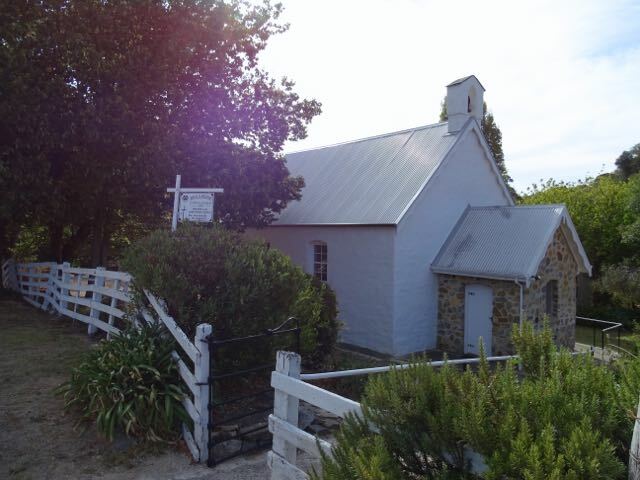 This historic building and beautiful garden is hidden away down a country gravel lane off the main road to the right as you head to Cape Jarvis. the lane is on the opposite side from the Delamere general store. Delemare is also home to the wind farm area – something you either love or hate on the hilly landscape. What is even more amazing is that this tiny church is still open for Sunday services. 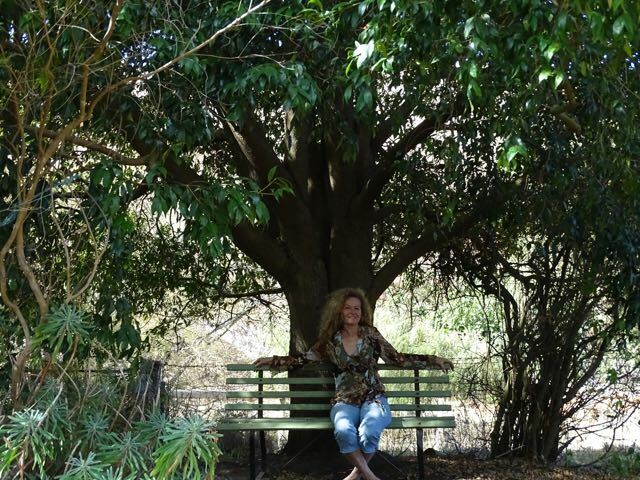 Take time to rest and contemplate in this tranquil country setting under the shade of an old tree. A weekend family getaway doesn’t mean you have to spend the entire time rushing around. 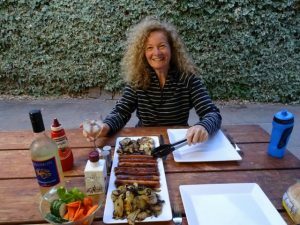 If you are staying at the Second Valley Caravan Park, why not cook a BBQ and sit around the open air and make some new friends. We met Germans, French and Australians in this coral style setting. 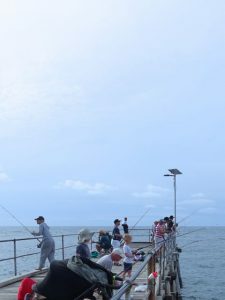 Second Valley Jetty is famous and well known to lure the keen angler. 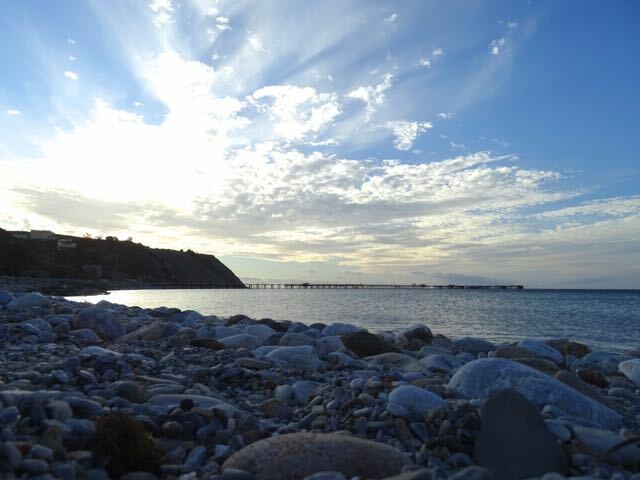 Bring your rods, and spend a few hours away from technology and enjoy the tranquillity of this beautiful cove. 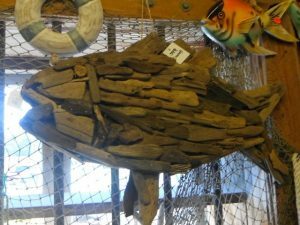 Bait is available at the Second Valley Jetty store along with some fishing gear. If you stay in the Second Valley Caravan Park then there are many complimentary fridges available for guests to store you precious catch of the day, or your bait. To the left of the Second Valley Jetty is a gorgeous cove that is perfect for toddlers. The low water makes a great paddle or wade pool area for the kids to enjoy. It is now fenced off so you can only access at low tide via the jetty where there is a turn off to the left. To the right of the jetty is another cove but with a more open beach area. 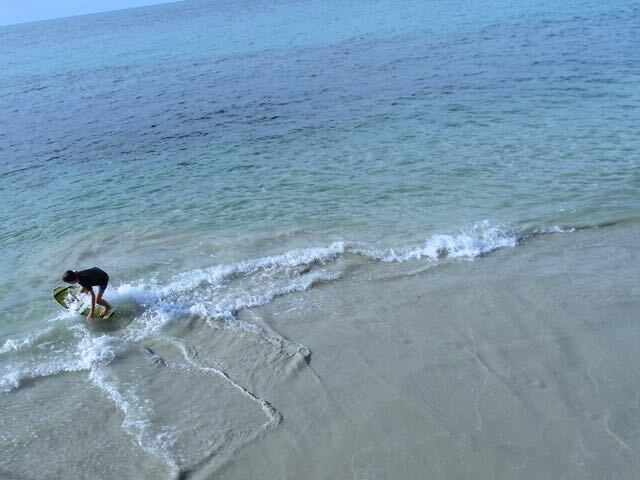 Here is a great place to learn paddleboarding because you can touch the soft sandy bottom. 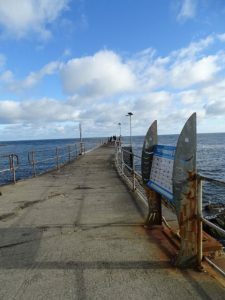 Enjoy a swim safely in this area, ensuring you keep your distance from the jetty where there are fishing lines and hooks you don’t want to become tangled in. Most of the beaches in this area are either smooth pebble or beautiful white sandy shores so its also great just to go for a drive, find a place to park, and then take a walk. 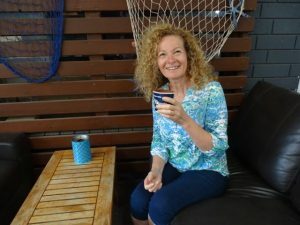 Keep your eyes open for a mystery lady named ‘Deb’. 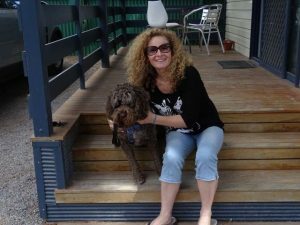 She’s a local who shares an unusual random act of kindness. We won’t show her face – you’ll have to seek her out. 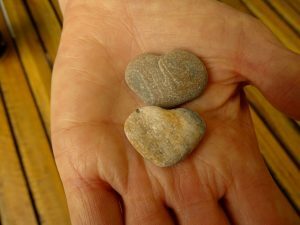 Her goal in life is to give out one million love-heart shaped rocks, sharing love to strangers. 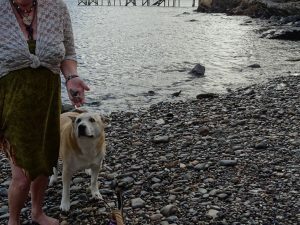 She collects heart-shaped rocks and gives them out to people she meets on the beach. Sometimes she will give you two rocks and ask you to give love away to a friend or family member. I loved talking with the famous ‘Heart Lady’. As much as we scoured the shores, we didn’t find so much as one heart-shaped rock, so she has a bit of a gift in finding natures free treasures. Second Valley has one of the most beautiful layered rock walls you will ever see but again it is a secret and hidden from many visitors. 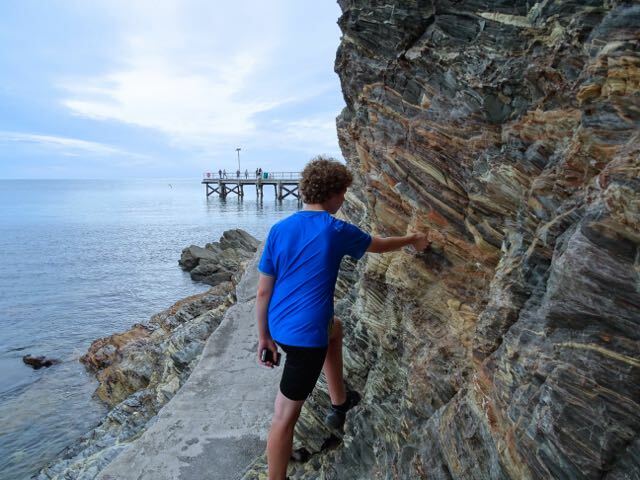 Get the kids out of the car and don their sneakers for a wall around the rocks. Part way along the jetty is a small opening that leads down to a path around the rock wall. About halfway along you will find this incredible layered wall. 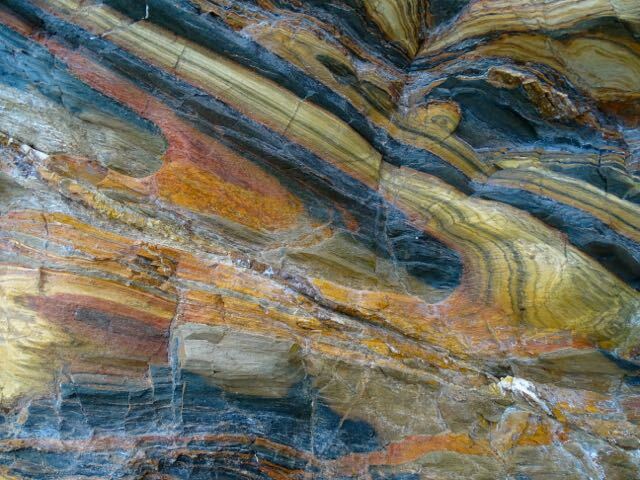 Why go all the way to Utah for layered rock walls, when South Australia boasts this beauty? Second Valley is known as one of the most beautiful beaches in Australia and a great place to bring your camera. We both loved time with our cameras photographing the hills and shore in the distance. It’s a perfect way to lose yourself in time. 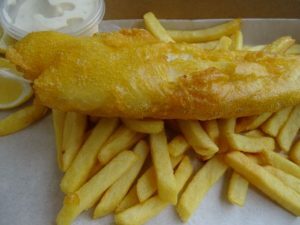 Nothing is quite as traditional as Fish and Chips on the beach from the recently refurbished Second Valley Jetty Store and Café. And now, with the added side café dining area, you can sit and eat your meal ‘Take Away’ style under cover and out of the heat of the day, or the odd wintery storm. 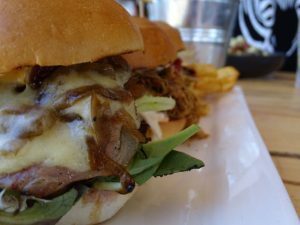 There is a great menu available so why bother bringing lunch when you can order great food here? 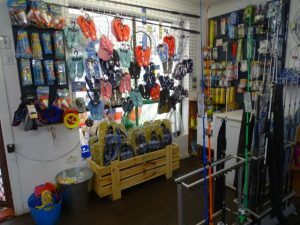 Plus the Jetty Store has everything but the kitchen sink available should you have forgotten anything for your weekend away. 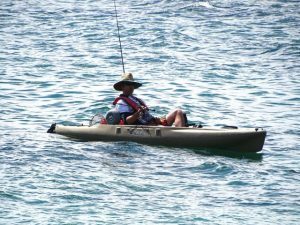 Hiring kayaks from the Second Valley Jetty Store is not only affordable family fun. It’s a great way to entice the kids into the ocean. 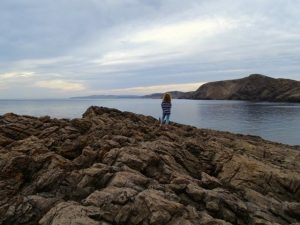 Providing the wind is calm, you can head out of the cove and explore the surrounding rocks and coves nearby. I am not a fan of daredevil sports, but there is a spot to the left of the Second Valley Jetty where you will see daredevils cliff-jumping. 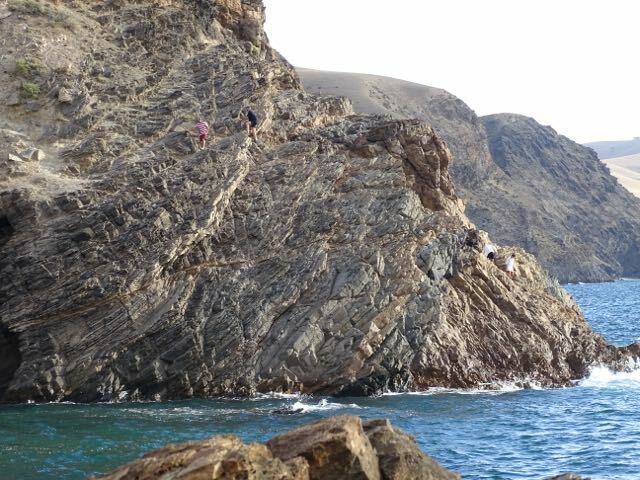 As a Mum, I hold my breath as I watch these folk taking a leap of faith. It’s great to watch, but please, consider your safety and the safety of others before attempting life-risking sports and crazy photos for the sake of Instagram. Please also be careful when climbing the hills and cliffs. Rescue helicopters have been used recently to come to the aid of stranded and unprepared climbers. Not to mention those that fall and break bones or worse. There are some beautiful walks and climbs where the correct equipment, footwear and clothing is important. Always remember to carry adequate drinking water with you too. St. Leonard’s Mill graces the heart of the Second Valley on the main road heading towards Cape Jarvis. With beautiful gardens, you will find this old mill to have been lovingly restored. 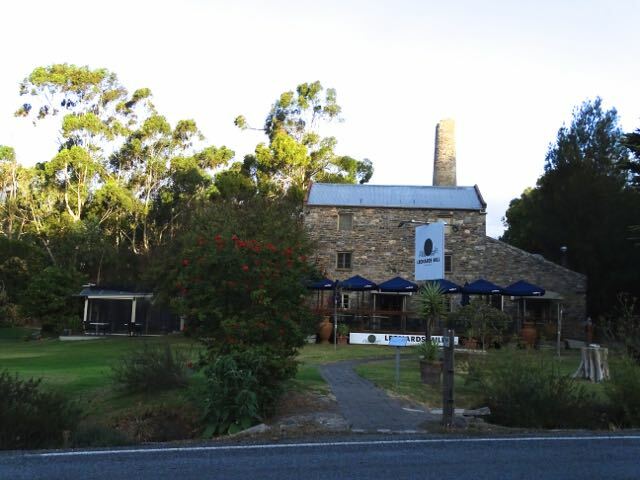 The Mill offers a Degustation Menu at $90 per person from Wednesday to Sunday and prefers an adult clientele, so although we include this, it might be the place for couples or Mum and Dad to dress up and enjoy an evening out without the children. 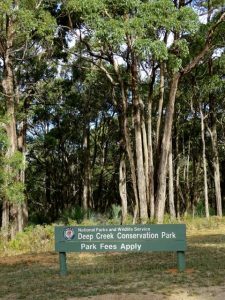 If you are heading out for a drive, then Cape Jarvis is the end of the road and the place to catch the Kangaroo Island ferry. Apart from a hotel, the main purpose of this town really is to service the ferry, but there’s a great lookout and a lighthouse there. 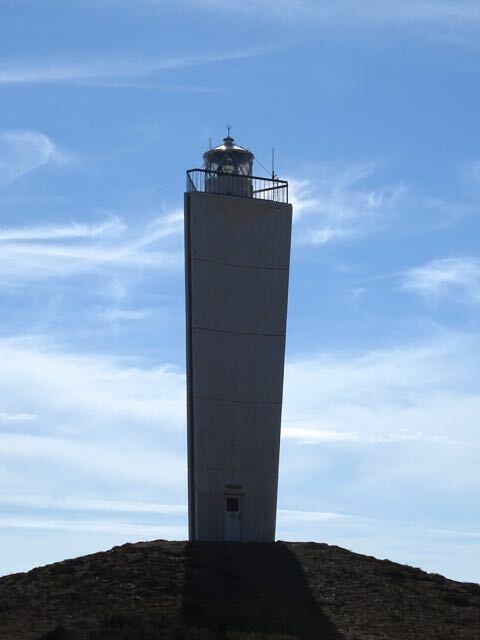 Head to the lighthouse at sunset for some fabulous skyline photos. 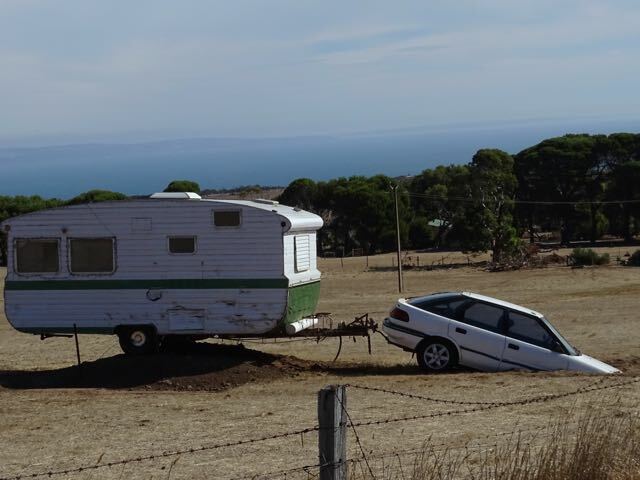 As you head out of Cape Jarvis on your right, have the kids keep their eyes open for the car that is pulling a retro caravan that is stuck in a ditch! Go on the hunt to find Oskar – a wonderful metal creation made by a 15-year-old named Flynn O’Malley of metal scraps. 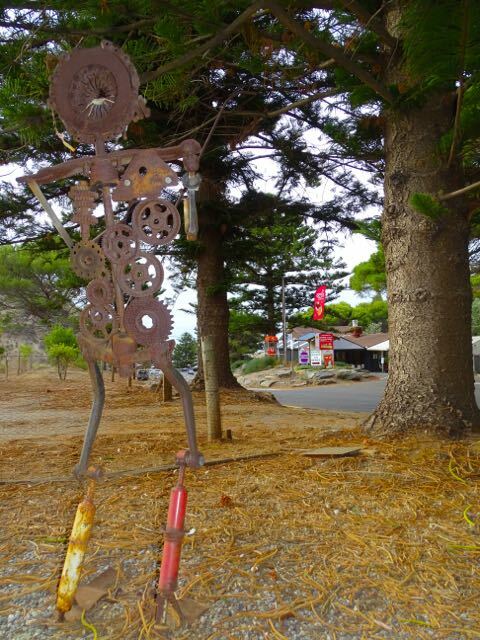 I will give you a hint – he is opposite the Second Valley Jetty Store but you will still have to hunt to find him. Stone stacking is becoming increasingly popular. 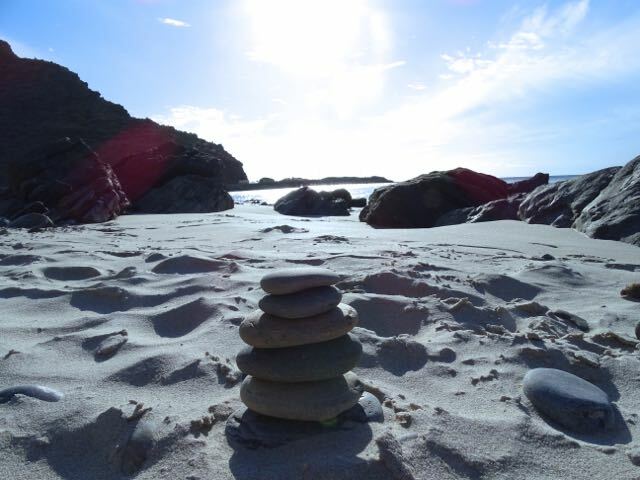 Gather some flat beach pebbles and see how tall a tower you can make. 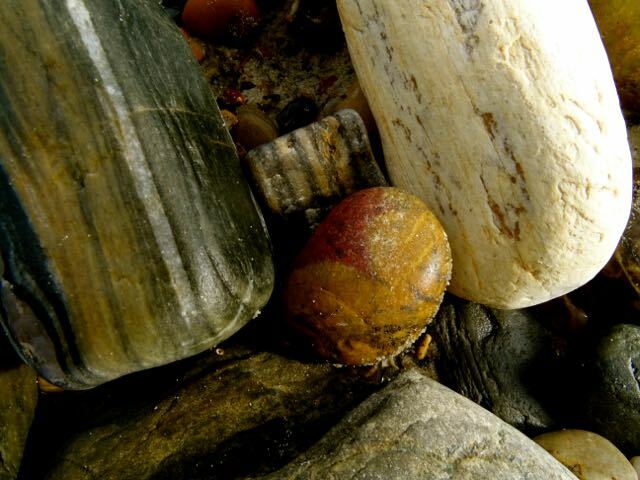 Some of the pebbles found on the Second Valley beach are round like Easter eggs. Others are unusual shapes. They are perfect for painting. So try to remember to pack the paints and paintbrushes for a great afternoon activity on a rainy day. Painted they can make great desk paperweights, or doorstoppers too. No trip to the seaside is complete unless you skim a few stones! Lots of lovely pebbles tha are perfect for this to the left of the Second Valley Jetty. 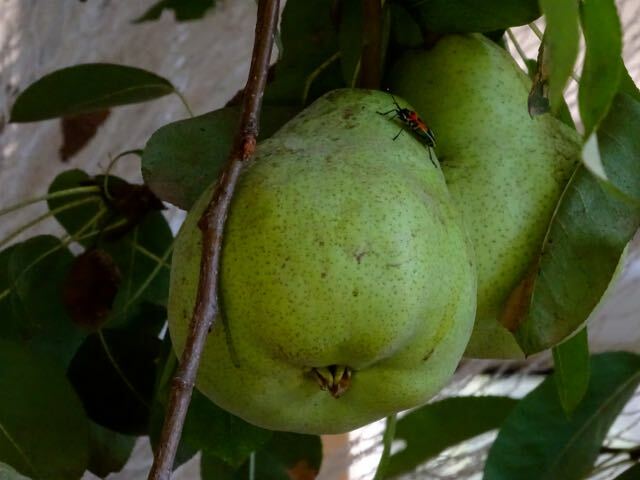 Just before Café Jarvis, there is the iconic Pear Tree Café complete with a mammoth pear tree that graces the courtyard. Perfect for morning or afternoon tea possibly with some jam on your scones and a nice pot of tea. It’s set back off the main road so it’s lovely and quiet and nice for the kids to run around and explore the grounds too. The next town along from Second Valley is Rapid Bay. It has one of the most expensive jetties ever built. This town was once where the ships collected rocks and grain and had a thriving industry. The town is a little bit like you drive back into the 1940s. Here you can see the old company manager’s homes and it is like time stood still. 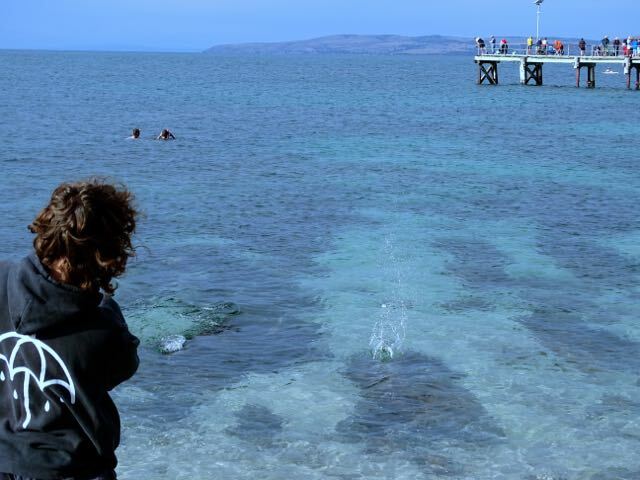 Rapid Bay is famous for its very long and expensive jetty too. There is a famous cave a lot of people hike or kayak too here. When I was a kid we camped in it once, but that is no longer allowed. 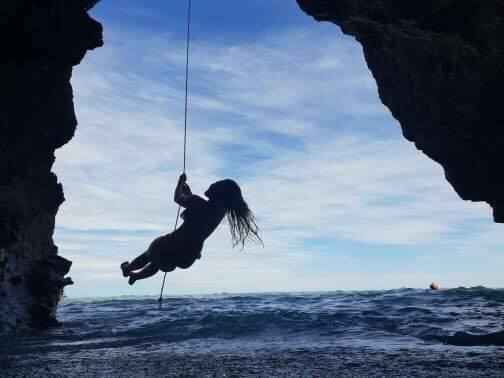 There is also a famous event that occurred earlier this year at Rapid Bay where a swing was hung in the cave over the water. This has become a famous location many seek to find. The swing has now been removed but the beautiful coastline is well worth exploring and can be accessed by kayaks on a calm day from Second Valley too. The beautiful white sand of Second Valley beach is perfect for children to enjoy. It’s fine and soft and just delightful! New Year’s Day is a sandcastle building competition day too so you can head down to Second Valley beach for that. Soak up the sun at this safe cove at Second Valley. There is free parking too! If you run out of sunscreen, please pop up and buy some at the Jetty Store as there is nothing worse than a wonderful day ending in pain. Plus, remember to protect your lips with a Chapstick style sunscreen, as I managed to get mine sunburnt when paddle-boarding. 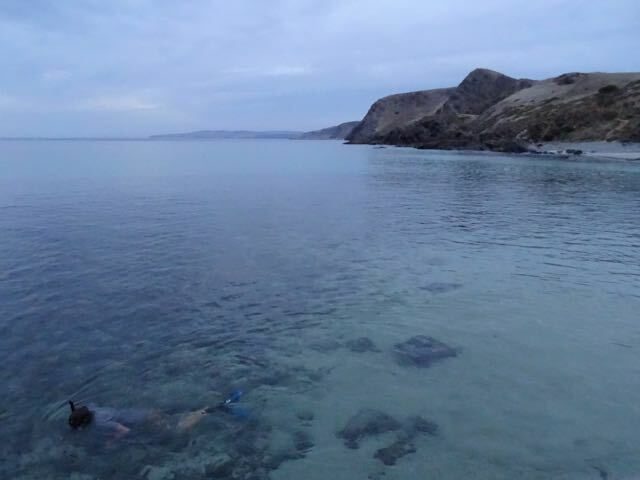 Snorkelling is a great activity and FREE to use the beach. 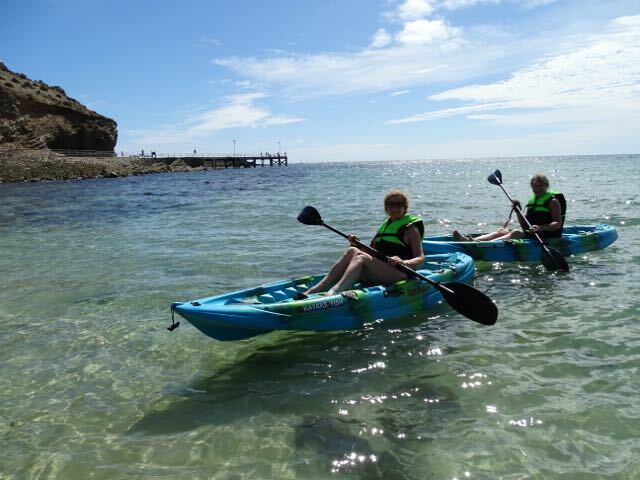 Bring your own equipment and enjoy snorkelling around the rock pools, nearby caves and coves. Hunt for the beautiful leafy seadragon that can be found in the region. The waters are very clear so its easy to see the sea life below. 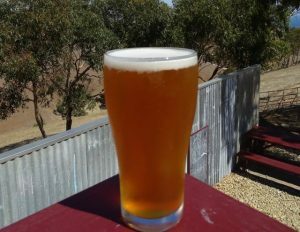 Heading out of Carrakalinga on the way to Myponga is a new microbrewery – Forktree Brewing. 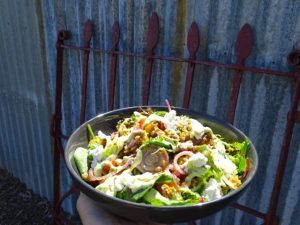 My teenage son loved the trio of burgers – a slider named ‘The Shed Favourites’ whilst for a healthy alternative my ‘Freekah Salad’ was the best ‘Pumpkin Salad’ I’ve ever eaten! Being a microbrewery you must try one of their beers with the ‘Sunrise Ale’ being my favourite. 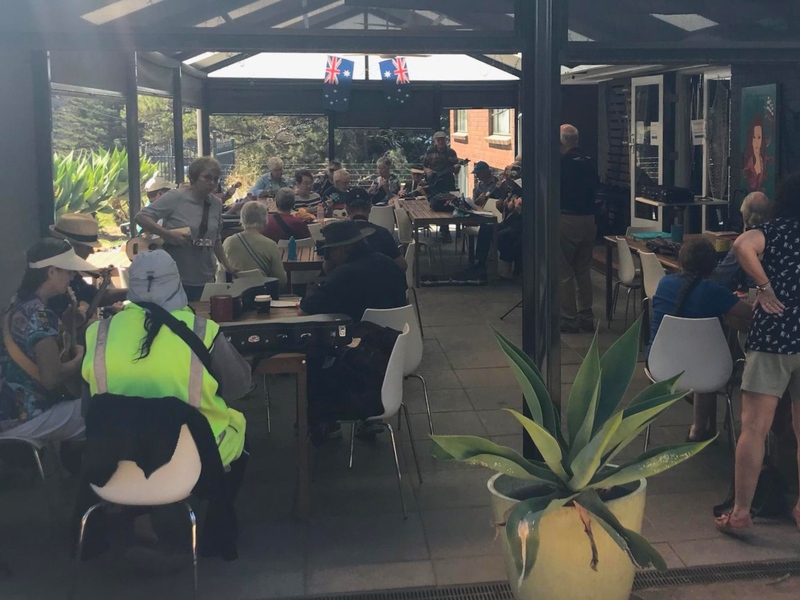 Second Valley Caravan Park hosts a yearly Ukulele Festival. Book early and stay and enjoy this musical weekend. 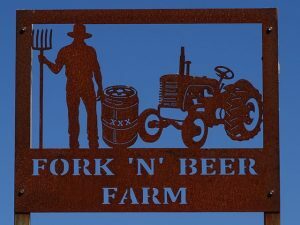 Watch out for farms that sell their own farm produce. Nothing is fresher and it supports local farmers. 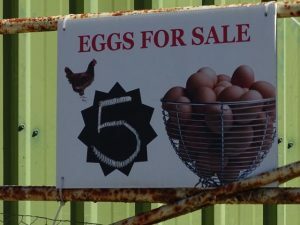 Free-range eggs are also available at Fork ‘N’ Beer Farm too. Other produce is, of course, available at the Second Valley Jetty Store if you need extra BBQ supplies etc. 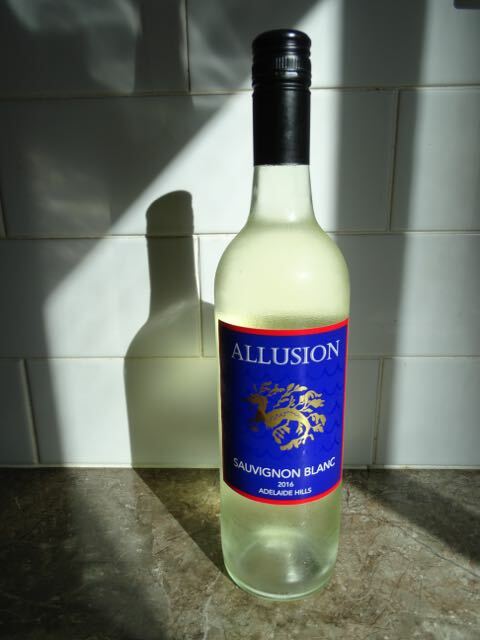 For a wonderful local wine, I’d recommend Allusion Wines. This is a well-established winery that has been in the area for many years. They have great wines too. 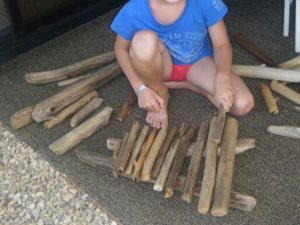 Collect some driftwood on the beach and use it to make some crafts or musical instruments. 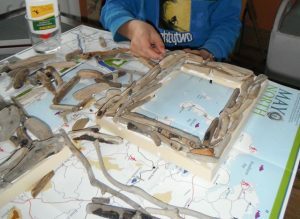 We’ve made picture frames, a xylophone and other crafts in the past for the debris we’ve found on the beach. Loads of fun for all the kids as they find interesting shapes. Also helps to teach our kids about recycling and upcycling too. I love the slashed rocks that at the very end of the walk, past the layer rock wall. Keep walking along the pebble beach cover and as long as the weather is calm, you can climb these rocks. These are similar rocks as to those we found at The Burren in Ireland, but here there are in South Australia! It is like God had a great knife and slashed the rocks a million times to create these incredible formations. Please be sure that little ones are well cared for in this area. People have died off of these rocks and on the far side is a plaque to commemorate tragic lives lost here. Enjoy the Slashed rocks, but please do take care and wear sensible shoes! Keep following the path past the rock wall and you will also find the old rusty Fisherman’s Winch. Up until the 1990s Boatsheds were built on the rocks but they became dangerous and derelict and eventually were removed. 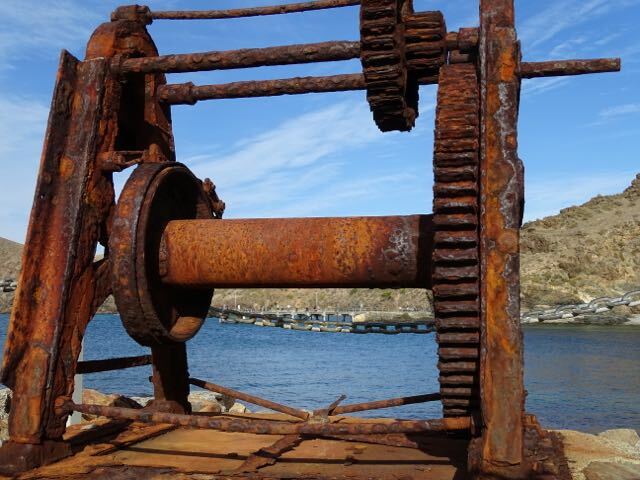 All that remains is the winch – see if the kids can find it. Book a cabin, pitch a tent, or pull up your caravan and relax in a small traditional park. 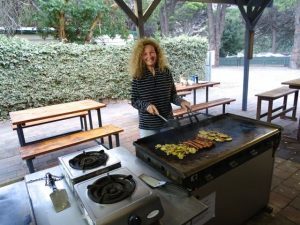 With new managers, new amenities and a new vision, Second Valley Caravan Park is the perfect place to relax and unwind. Because it is small, we found it to be peaceful. I also love that once we unpacked we could just walk down to the beach without having to drive. As it is time to drive back to Adelaide, we reflect on the perfect weather, the beautiful location and the wonderful few days we have just enjoyed. What are your favourite things to do as a family when you go on vacation? Have you ever been to Second Valley? 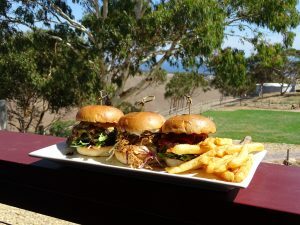 If you know of anyone heading to South Australia, or Fleurieu Penninsula, we’d love you to share this article with them. 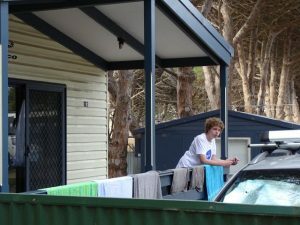 And if you’d like to go down and stay, then Second Valley Caravan Park might just be the perfect spot for you too.